Have you ever found yourself in the following situation when competing in a match — whether it be BPCR Silhouette, Long Range, or Schuetzen? It’s at that moment in time when either you, your spotter, or a nearby friend has to sprint to your equipment box, rummage through your gear, and retrieve whatever piece of equipment you forgot to bring with you to the firing line. Talk about an unneeded distraction at a critical moment in time! Well, I’ve seen this exact scenario happen at least a dozen times over the past couple of years. That’s why, shortly after I entered the sport, I decided that the best way to avoid a situation like the one I’ve just described was to assemble what I call a “Shooter’s Tray”. Others may call it a “Firing Line Kit” or an “Equipment Kit”. Basically it’s a tray or box in which you can keep all of the small and essential items that you may need when you are on the firing line. Everything in one place — not floating around inside your main equipment box or the trunk of your car. I made my Shooter’s Tray using the plastic tool tray that came with one of the Rubbermaid tool boxes in which I store all of my BPCR equipment. I added a couple of metal pencil holders that I bought at my local OfficeMax store and made an oak ammunition block that fits the dimensions of the tray perfectly. Now, when I go to the line to shoot my relay, I carry my tray along with me and set it next to my firing position within easy reach. If I need to change sight inserts, I have two sets of inserts in my tray. If I want to change the color of the lenses in my shooting glasses, I have them in my tray. 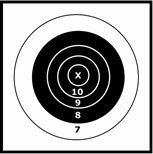 If I can’t remember what my sight settings were for a particular yardage the last time I shot it, I have a card in my tray with those settings recorded. The only items that I need to take to the firing line with me, in addition to my Shooter’s Tray, whenever I shoot BPCR Silhouette or Long Range are my shooting mat, cross-sticks, and spotting scope (for Long Range only). 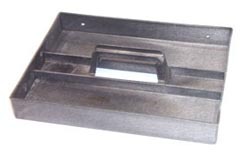 Just about any type of tray with a carrying handle can serve as the foundation for your Shooter’s Tray. 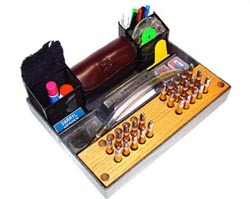 Assemble everything that you think you may need at the firing line, and then organize it into an easy-to-use, one stop command center for your firing line activities!